As No. 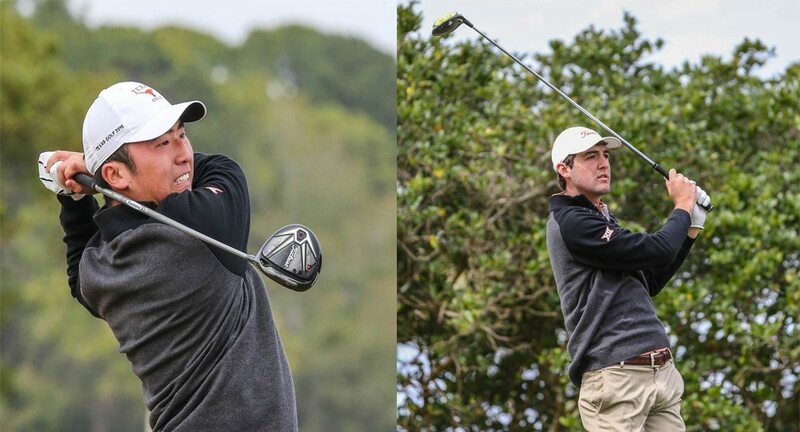 2 Texas Men's Golf closes in on the final round at the Big 12 Championship, it is clear that each member of the team plays a role in its success. All five golfers currently stand in the top-20 on the player leaderboard and three of the five are hogging the top-three spots. Three of the guys have been here before. But for two, it is their first Big 12 Championship. Freshmen Scottie Scheffler and Doug Ghim came to Texas as two of the country's best amateurs and with very high expectations. And now, in April, they are peaking and living up to the expectations. "Both Scottie and Doug are outstanding players," Texas Head Coach John Fields said. "Coming in as freshmen, we knew that they could be two of the best players in the nation, and it has taken some time for them to get comfortable with school, being away from home, being in new surroundings and being on a really good golf team." Neither Scheffler nor Ghim had rough starts to the season back in September. Ghim played in three fall tournaments, did not finish outside the top 25 and had a career-best tie for third in his third tournament as a Longhorn. Scheffler has six top-10 finishes and most recently earned medalist honors at the Western Intercollegiate a few weeks ago. But both would tell you they are playing better and feel more comfortable and confident. "My short game has been pretty good the last couple of weeks and I'm starting to drive it better, too," Scheffler said. "I feel like I've been putting in more work than I did at the beginning of the season and just needed to get through the adjustment of coming to college." One of the major factors in adjusting has been the rest of the team. In addition to Scheffler and Ghim, Texas has two seniors, two juniors, three sophomores and three freshmen. And every one of them have welcomed each other and helped in more ways than one. "My teammates have helped me a lot," Ghim said. "All of our guys are world-class players and they are quick to help the freshmen—whether it's school or golf, or something else. These guys have played all these courses before and they really make sure that when we are coming into a tournament that we know what to expect and show us the ropes. And it really does help." Fields and Assistant Coach Jean-Paul Hebert have also been instrumental in developing the golfers and helping them find their stride. "Coach (Fields) has helped with the adjustment," Scheffler said. "He's hands-off, which I like a lot, but mostly he has just helped me get comfortable. He always explains what the golf course is going to be like and make sure I have everything I need to be successful." As the Big 12 Championship comes to an end and the NCAA postseason begins, there is no better time to peak. "There was a lot of pressure for them to perform and they've lived up to it," Fields said. "They're doing a great job, coming on now and getting more comfortable and their real abilities are starting to show."